This article is about the album. For other uses, see Full Moon Fever (disambiguation). Full Moon Fever is the debut solo studio album by Tom Petty, released on April 24, 1989, by MCA Records. It features contributions from members of his band the Heartbreakers, notably Mike Campbell, as well as Jeff Lynne, Roy Orbison (who died prior to its release), and George Harrison, Petty's bandmates in the Traveling Wilburys. The record shows Petty exploring his musical roots with nods to his influences. The songwriting is mainly collaborations between Petty and Lynne, who was also a producer on the album. The album became a commercial and critical success peaking at No. 3 on the U.S. Billboard 200 and being certified 5× platinum in the United States and 6× platinum in Canada. 4 "Hello, CD listeners ..."
Having earlier in 1987 finished a Heartbreakers tour behind the album Let Me Up (I've Had Enough), Petty decided to record a solo album without the Heartbreakers (similar to the arrangement between Bruce Springsteen and The E Street Band at the time). This stirred some controversy among members of the Heartbreakers, although all but drummer Stan Lynch contributed to the album. Benmont Tench and Howie Epstein initially were not happy about playing the Full Moon Fever songs live during Heartbreakers concerts. Lynch hated playing them right up until his departure from the band, saying it made him feel like he was in a cover band. The recording process in 1988 was a low-key affair, with many of Petty's friends contributing, including the members of the Traveling Wilburys, minus Bob Dylan. Recorded mainly in the relaxed atmosphere of Mike Campbell's garage studio, Petty would later say it was the most enjoyable record of his career. Recording of Full Moon Fever was actually interrupted to allow time for recording of the first Wilburys' album. Two songs recorded during the sessions did not make the Full Moon Fever album. "Down the Line" and "Don't Treat Me Like A Stranger" were released as B-sides. During the sessions, Petty wrote "Indiana Girl", an early draft of what would eventually become "Mary Jane's Last Dance". The album is noted for being heavily influenced by Jeff Lynne, resulting in a cleaner and glossier version of the Heartbreakers' roots rock from previous albums. Lynne incorporated layers of keyboards and backing vocals, giving it a Beatlesque feel. The songs show Petty paying dues to his influences with a Byrds cover ("I'll Feel a Whole Lot Better") and a nod to Del Shannon in "Runnin' Down a Dream". Other songs, such as "Free Fallin'", show Petty addressing nostalgia on his rise to fame. "A Mind With a Heart of Its Own" uses a Bo Diddley-style rhythm, while "The Apartment Song" features an instrumental break with paradiddle drumming reminiscent of Buddy Holly's "Peggy Sue". The album, which became Petty's commercial peak as an artist, was helped by favorable critical reviews and three hit singles. The album was released on April 24, 1989 and rose to eventually peak at No. 3 on the U.S. Billboard 200 and No. 8 in the UK. Five singles were released from the album; two hit the top 20 of the U.S. Billboard Hot 100 and three topped the U.S. Mainstream Rock chart. 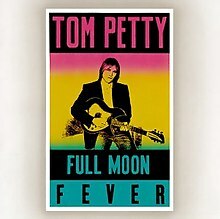 The RIAA certified Full Moon Fever 5× platinum on October 5, 2000 in the US and the CRIA certified it 6× platinum on September 18, 1991 in Canada. Critical praise was generally high, with AllMusic giving the album 4-and-a-half stars in a retrospective review, admiring the craft of the album and rivaling it with the Heartbreakers' Damn the Torpedoes. This review notes there are no weak tracks on the album, calling it a "minor masterpiece". The original Rolling Stone review compared the album favorably to the Traveling Wilburys' debut, Traveling Wilburys Vol. 1, saying it has the "same restless charm", but commenting that Full Moon Fever at times seems "sprawling". The review claims the album is "another rewarding, low-key side project for Petty", giving it three-and-a-half stars out of five. A later Rolling Stone biographer claims Full Moon Fever was a "masterful solo album". It was ranked number 92 on Rolling Stone magazine's list of the 100 best albums of the 1980s. The original U.S. compact-disc release of the album contains a hidden track in the pregap of Track 6 ("I'll Feel a Whole Lot Better"), at the point where cassette or LP listeners would have to flip sides to continue. The track consists of a brief tongue-in-cheek monologue by Petty,[a] over a background of barnyard noises. The interlude is not included in other physical versions of the album, though it is mentioned (as "Attention CD Listeners") in the album credits in all versions. It was reintroduced in streaming versions of the album, such as that offered by Tidal and Pandora. All tracks written by Tom Petty and Jeff Lynne, except where noted. George Harrison – acoustic guitar and backing vocals on "I Won't Back Down"
Jim Keltner – drums, maracas and tambourine on "Love Is a Long Road"
Benmont Tench – piano on "The Apartment Song"
Howie Epstein – backing vocals on "I Won't Back Down" and "Love Is a Long Road"
Roy Orbison – backing vocals on "Zombie Zoo"
Kelsey Campbell – scream on "Zombie Zoo"
Alan Weidel, Jeff Lynne, Tom Petty – hand claps on "I'll Feel a Whole Lot Better"
Engineers: Mike Campbell, Don Smith, and Bill Bottrell; Dennis Kirk on "Love Is a Long Road"
^ In the monologue, Petty says: "Hello, CD listeners. We've come to the point in this album where those listening on cassette, or record, will have to stand up, or sit down, and turn over the record, or tape. In fairness to those listeners, we'll now take a few seconds before we begin side two. [pause] Thank you. Here's side two." ^ a b c d e f g h i Guterman, Jimmy (May 4, 1989). "Full Moon Fever". Rolling Stone. Retrieved April 26, 2009. ^ a b c d e f g Erlewine, Stephen Thomas. "Full Moon Fever – Tom Petty". AllMusic. Retrieved April 26, 2009. ^ a b Jones, Chris (2009-01-09). "Review of Tom Petty - Full Moon Fever". BBC. Retrieved 2009-04-26. ^ a b c d e "Allmusic: Full Moon Fever : Charts & Awards : Billboard Albums". allmusic.com. Retrieved 2014-03-01. ^ a b "RIAA Searchable Database". RIAA. Retrieved 2009-04-26. ^ a b "CRIA Searchable Database". CRIA. Archived from the original on 2009-04-12. Retrieved 2009-04-26. ^ Corcoran, Michael (August 1989). "Tom Petty's 1989 Full Moon Fever Cover Story: Raised on Promises". Spin. ^ "Full Moon Fever by Tom Petty". classicrockreview.com. ^ "Tom Petty: Full Moon Fever". Blender. Archived from the original on June 11, 2010. Retrieved October 30, 2015. ^ Silverman, David (May 11, 1989). "Tom Petty: Full Moon Fever (MCA)". Chicago Tribune. Retrieved November 13, 2013. ^ Willman, Chris (April 23, 1989). "Record Rack: Petty Laughs Last on 'Full Moon Fever'". Los Angeles Times. Retrieved November 13, 2013. ^ Moon, Tom (May 14, 1989). "Tom Petty: Full Moon Fever (MCA)". The Philadelphia Inquirer. ^ Johnston, Maura (October 10, 2017). "Tom Petty: Full Moon Fever". Pitchfork. Retrieved October 14, 2017. ^ Kemp, Mark (2004). "Tom Petty". In Brackett, Nathan; Hoard, Christian. The New Rolling Stone Album Guide (4th ed.). Simon & Schuster. pp. 632–33. ISBN 0-7432-0169-8. ^ Christgau, Robert (June 27, 1989). "Consumer Guide". The Village Voice. Retrieved October 30, 2015. ^ "AllMusic Tom Petty Bio". AllMusic. Retrieved 2009-04-29. ^ a b c "Tom Petty: Artist: Official Charts". UK Albums Chart. Retrieved 2013-09-08. ^ "Rolling Stone Bio". Rolling Stone magazine. Retrieved 2009-04-29. ^ Wagner, Nichole (2008-06-03). "Roundup: Hidden Tracks". Uncommon Music. Retrieved 2014-07-15. ^ Rotondo, Andrea M. (2014). Tom Petty: Rock ‘n’ Roll Guardian. Omnibus Press. p. 169. ISBN 9780857128683. ^ Breihan, Tom (October 3, 2017). "A Heart So Big: 20 Great Tom Petty Moments". Stereogum. ^ "australian-charts.com Tom Petty - Full Moon Fever". Australian Recording Industry Association. Retrieved 2011-10-03. ^ "Top Albums/CDs - Volume 50, No. 15" (PHP). RPM. 1989-08-07. Retrieved 2014-05-01. ^ "dutchcharts.nl Tom Petty - Full Moon Fever". dutchcharts.nl (in Dutch). MegaCharts. Retrieved 2011-08-08. ^ "Tom Petty - Full Moon Fever" (in German). Media Control. Retrieved 2011-10-03. ^ "charts.org.nz —Tom Petty - Full Moon Fever". Recording Industry Association of New Zealand. Retrieved 2011-10-03. ^ "norwegiancharts.com". VG-lista. Retrieved 2011-10-03. ^ "swedishcharts.com Tom Petty - Full Moon Fever" (in Swedish). Sverigetopplistan. Retrieved 2011-10-03. ^ "RPM Top 100 Albums of 1989". RPM. 1989-12-23. Retrieved 2011-10-03. ^ "Top 100 Albums of 1990". RPM. 1989-12-23. Retrieved 2011-10-03. ^ "Billboard.BIZ - Year-end Charts - Billboard 200 - 1990". billboard.biz. Retrieved 2011-09-18. ^ "Canadian album certifications – Tom Petty – Full Moon Fever". Music Canada. ^ "British album certifications – Tom Petty – Full Moon Fever". British Phonographic Industry. Select albums in the Format field. Select Gold in the Certification field. Type Full Moon Fever in the "Search BPI Awards" field and then press Enter. ^ "American album certifications – Tom Petty – Full Moon Fever". Recording Industry Association of America. If necessary, click Advanced, then click Format, then select Album, then click SEARCH.